Triisopropanolamine is an aminoalcohol and belongs to the group of alkanolamines. It is white to yellow solid or liquid based on room temperature. It is completely soluble in water and has a slight, ammonia-like odor. It is a versatile chemical that is used in a variety of applications. What are the applications for TIPA? Triisopropanolamine (TIPA) is used mainly as a grinding aid in cement production, especially for high-quality types of cement. In addition, triisopropanolamine (TIPA) serves as a dispersing agent for paints and pigments like titanium dioxide. Triisopropanolamine is also used in the production of cutting oils and PU catalysts. In what form does Gopher supply TIPA? 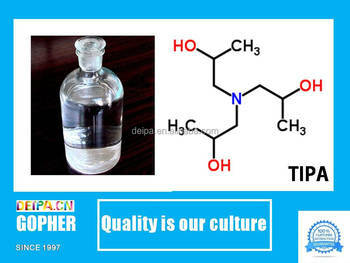 We supplies TIPA 85% or 99% purity and as a technical grade around the world. The package of TIPA can be iron drums, IBC drums and also according to the requests of customers.